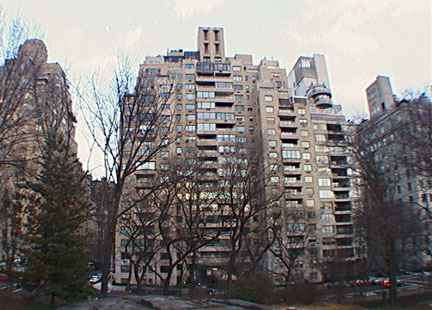 In 1950, this imposing, 20-story cooperative apartment building replaced the Thomas Fortune Ryan mansion of 1895 designed by William Schickel & Company and an adjoining, colonnaded garden that was the former site of the Charles T. Yerkes mansion, which had been designed by R. H. Robertson in 1896. By then, "Millionaires' Row" had already been substantially decimated by other post-war demolitions that were inexcusable, though economically understandable, actions in a city that did not pass a landmarks law until the 1960's. Imagine, if you will, if most of the great mansions, and the Ryan fortune was one of the city's greatest, had remained and the new high-rise residential construction pushed to Madison Avenue or further east! For residents of the 159 cooperative apartments here, of course, the question is moot as they are delighted at their wonderful views from broad balconies at this super location. Well, perhaps, not all of them as many of the balconies have been enclosed over the years, compromising the architectural integrity of the original design by Sylvan Bien as well as raising difficult questions about how this building complies with the city's zoning since the enclosed balconies add considerable and very valuable interior space to the building. 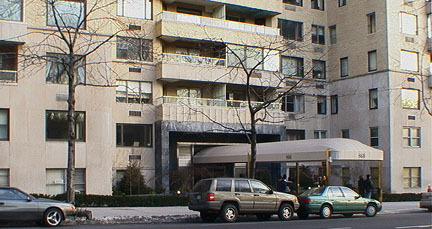 (Another building that also had many of its balconies enclosed is 1056 Fifth Avenue (see The City Review article). This beige-brick building is strongly modeled with a setback central façade flanked by wings that stretch to the building line. The solid-wall balconies, which project from the façade as well as recess within it, give the building a robust horizontal emphasis, which is in keeping with its continuity with the existing streetwall and cornice lines. The watertank is handsomely enclosed in a simple, perforated enclosure that is consistent with the rest of the building. The building has a three-story limestone base with a handsome dark polished stone entrance surround, discrete air-conditioners and sidewalk landscaping.